Cricket is a World level sport played with bat-and-ball. Many distinctions exist, with its most popular form played on an oval-shaped outdoor arena known as a cricket field, at the centre of which is a rectangular 22-yard (20.12 m) long pitch that is the focus of the game. A game is contested between two teams of eleven players each. One team bats first to score as many runs while the other team bowls and fields trying to dismiss the batsmen and thus limit the runs scored by the batting team. A run is scored by the striking batsman hitting the ball with his bat, running to the opposite end of the pitch and touching the crease there without being dismissed. The teams switch between batting and fielding at the end of an innings. There are also variations in the length of a game of cricket. In professional cricket this ranges from a limit of 20 over’s of six bowling deliveries per side Twenty20 to a game played over 5 days Test cricket, which is the highest level of the game. Depending on the form of the match being played, there are different rules that govern how a game is won, lost, drawn or tied. The rules of two-innings games are known as the Laws of Cricket and maintained by the International Cricket Council (ICC) and the Marylebone Cricket Club (MCC); additional Standard Playing Conditions for Test matches and One Day Internationals augment these laws. Cricket was first documented as being played in southern England in the 16th century. By the end of the 18th century, it had developed to the point where it had become the national sport of England. The expansion of the British Empire led to cricket being played overseas and by the mid-19th century the first international matches were being held. The ICC is the game's governing body and currently has 105 member countries. Cricket is most popular in the Test playing countries. A cricket match is played between two teams of eleven players each on a field of variable size and shape. The ground is grassy and is prepared by grounds men whose jobs include fertilizing, mowing, rolling and leveling the surface. Field diameters of 137–150 meters (150–160 yd) are usual. 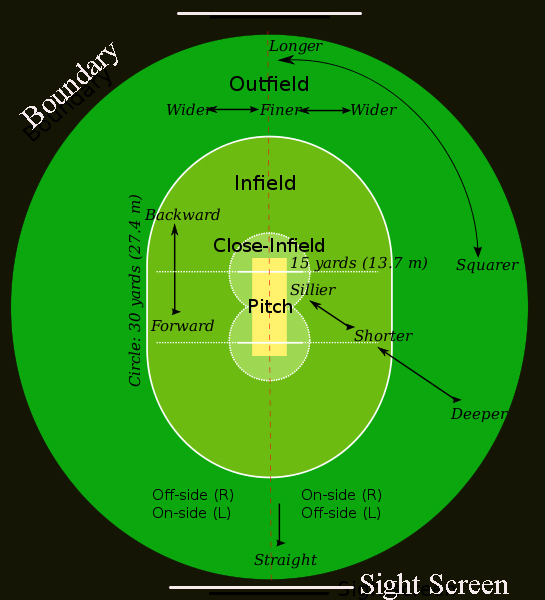 The perimeter of the field is known as the boundary and this is sometimes painted and sometimes marked by a rope that encircles the outer edge of the field. The Laws of Cricket do not specify the size or shape of the field but it is often oval – one of cricket's famous venues is called The Oval. Before play commences, the two team captains toss a coin to decide which team shall bat or bowl first. The captain who wins the toss makes his decision on the basis of tactical considerations which may include the current and expected field and weather conditions. The key action takes place in a specially prepared area of the field generally in the centre that is called the pitch. A run is scored when the batsman has run the length of the pitch after hitting the ball with his bat, although as explained below there are many ways of scoring runs. If the batsmen are not attempting to score any more runs, the ball is dead and is returned to the bowler to be bowled again. Here is the detail about the Batsman & Bowler pitches. At either end of the pitch, 22 yards (20 m) apart, are placed the wickets. These serve as a target for the bowling side and are defended by the batting side which seeks to accumulate runs. The pitch is 22 yards (20 m) or one chain in length between the wickets and is 10 feet (3.0 m) wide. It is a flat surface and has very short grass that tends to be worn away as the game progresses. The condition of the pitch has a significant bearing on the match and team tactics are always determined with the state of the pitch, both current and anticipated, as a deciding factor. Each wicket consists of three wooden stumps placed in a straight line and surmounted by two wooden crosspieces called bails; the total height of the wicket including bails is 28.5 inches (720 mm) and the combined width of the three stumps is 9 inches (230 mm). 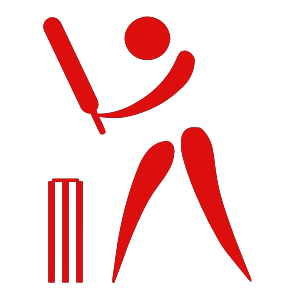 Four lines, known as creases, are painted onto the pitch around the wicket areas to define the batsman's safe territory and to determine the limit of the bowler's approach. These are called the batting crease, the bowling crease and two return creases.